The upright class – mobility at its finest These powerful and robust machines stand out due to their manoeuvrability and easy transport. This makes the upright class an economical alternative for diverse workshops, small garages and cleaning service providers. 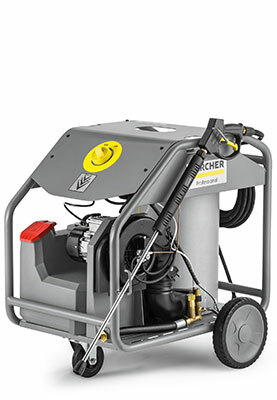 Competitively priced entry class model of a hot water high-pressure cleaner. Innovative "Upright"-Design ensures good mobility and ergonomics. Very user-friendly due to one-button-operation and integrated hose and accessory stowage. Hot water compact class – simple operation for everyone Innovative technology – easy handling: the compact class features one-button operation, chassis with integrated tank and on-board high-pressure hose drum. Single-phase HDS 6/14 C hot water high-pressure cleaner with eco!efficiency mode, Easy Press trigger gun and intuitive single-button operation. The three-phase HDS 8/18-4 C Classic is the most powerful hot water high-pressure cleaner in the compact class. With 4-pole, water-cooled electric motor .. Hot water special class – for exhaust-free operation When exhaust gases are to be avoided or prohibited: the special class with electric heating is used in hygiene areas, hospitals, canteen kitchens or public baths. The HDS-E 8/16-4M with electric boiler is ideal where exhaust gases are undesired. Thanks to a unique type of boiler insulation and eco!efficiency mode, it is efficient and eco-friendly. Hot water middle class – for a wide range of applications For car dealerships, building trade, agriculture and municipal use: the middle class combines innovative technology with maximum operating convenience. Ideal for heavy-duty use. The most powerful three-phase hot water high-pressure cleaner in the Kärcher middle class: HDS 10/20-4 M Classic. With 4-pole, water-cooled electric motor, two cleaning agent tanks and much more. Hot water super class – efficient in daily continuous use Whether the automotive industry, agriculture, construction or forwarding industry: the mobile super class offers top class performance where work once had to be carried out stationary. The powerful HDS 12/18-4 S Classic hot water high-pressure cleaner offers a high flow rate and optimised burner engineering for economical operation. Powerful high-pressure cleaner rated for maximum cleaning performance and equipped to provide excellent user convenience. High-pressure cleaners with combustion engine - the independent ones Where there is no power source, high pressure cleaners with combustion engine – with optional biodiesel operation – offer maximum versatility and independence. Diesel-fuelled hot-water high-pressure cleaner with float tank, anti-scale protection, fuel shortage safeguard, steam level and infinitely variable pressure and water flow rate. It's a simple fact: Hot water has higher cleaning power than cold water. We recommend our hot water generator for anyone who needs this additional advantage in their everyday work, i.e. as a cost-effective upgrading of their existing cold water high-pressure cleaner. It is simply connected at the outlet of the high-pressure cleaner and supplies up to 80 °C hot water. Very efficient and low emissions. For even better cleaning results in event of especially stubborn dirt. Please note that different country versions are available for most products: 120 V / 60 Hz or 220-240 V / 50 Hz. With our HG 64 hot water generator (64 kW heat output), you can cost-effectively transform any cold water high-pressure cleaner into a hot water machine with higher cleaning performance.